NEW YORK--(BUSINESS WIRE)-- Today, Visa announced a new sponsorship of Hudson Yards becoming the official payment technology partner of New York’s newest neighborhood and destination for culture, commerce and cuisine. The new relationship between Visa and Hudson Yards merges the best in culture with industry leadership in connected commerce, enabling Hudson Yards’ anticipated millions of annual, domestic and international visitors to have fast, seamless and secure payment experiences while on property. 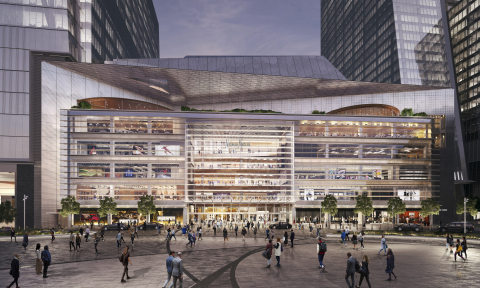 As one of the largest mixed-use real estate projects in the world featuring more than 100 shops and restaurants, Hudson Yards provides an ideal environment for Visa to showcase the latest in payments. Visa plans to develop programs to pilot and promote unique, “only at” payments experiences for cardholders on the property. To attract international and domestic visitors to Hudson Yards, Visa will work to establish cardholder benefits and moments that offer preference and access, and allow customers to tap to pay with their contactless card or payment-enabled device at checkout. Using a contactless card to tap to pay is becoming the preferred way to pay around the world with more than 40 percent of Visa domestic transactions – excluding the U.S. – occurring with a single tap1. The Visa-Hudson Yards specific programming will be aimed at delighting a global audience and showcasing the speed and convenience that contactless technology delivers to consumers and merchants. Hudson Yards is a newly built, 28-acre neighborhood on Manhattan’s West Side. Its retail complex features New York’s first and only Neiman Marcus, a robust collection of renowned global brands and a distinguished restaurant collection curated by Chef Thomas Keller. Visa Inc. (NYSE: V) is the world’s leader in digital payments. Our mission is to connect the world through the most innovative, reliable and secure payment network - enabling individuals, businesses and economies to thrive. Our advanced global processing network, VisaNet, provides secure and reliable payments around the world, and is capable of handling more than 65,000 transaction messages a second. The company’s relentless focus on innovation is a catalyst for the rapid growth of connected commerce on any device, and a driving force behind the dream of a cashless future for everyone, everywhere. As the world moves from analog to digital, Visa is applying our brand, products, people, network and scale to reshape the future of commerce. For more information, visit https://usa.visa.com/about-visa/our_business.html, visacorporate.tumblr.comand @VisaNews. Hudson Yards is an entirely new neighborhood on Manhattan’s West Side being developed by Related Companies and Oxford Properties Group. The largest private development in the United States, Hudson Yards comprises more than 18 million square feet of mixed-use development. When complete, Hudson Yards will include more than 100 shops and restaurants, signature restaurants and diverse eateries; approximately 4,000 residences; 14-acres of public open space; a new 750-seat public school and an Equinox Hotel® with more than 200 rooms – all offering unparalleled amenities for residents, employees and guests. For more information on Hudson Yards, please visit www.HudsonYardsNewYork.com. For more information about Hudson Yards, including accessing high-resolution images and renderings, please visit: https://related.app.box.com/s/vzztkolraobv61pqnzslqdheraikswqj.